Royal Govt Jobs: The Fastest growing Free Job Alert site in India Latest Govt Jobs, Railway Jobs, SSC Jobs, PSC Jobs, Bank Jobs, Police Jobs , Engineering Jobs, Professional Jobs, Teaching Jobs etc. Note : Save this number 7427000475 on your mobile as RoyalGovtJobs name. Go to your WhatsApp and refresh your contacts. Thereafter click on “Active” Button. Otherwise you will not get any update from us. Please Save This Number 7427000475. Instruction – You are advised to don’t send any kind of jokes and funny photos or videos on this number. If you want to unsubscribe Freejobalert service, Then you must delete our mobile number from your mobile. It will be automatically stop. Day by day Freejobsalert – There are many students who are spending lots of time to find government jobs details, and sometime they are unable to find desired job on internet. Now stop to searching on google. 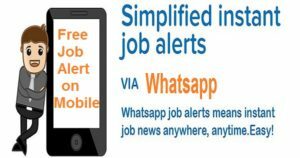 We will give you all job information on your Whatsapp. People who are seeking for Govt Jobs in India, then our web portal is the one-stop solution for all the latest Central & State Government job recruitment notification. We here in this website gather day to day recruitment notification from various government organization and post it here. So that you people do not have to go through various government organization’s website for the same. We provide all these information for free, so you can simply activate Free Job Alert service on this page. Once you activated our service. You will received daily freejobalert by us. We will not take any kind charge for this service. It’s is totally free service for students interest. May I kindly be requested for a job. Please help me. Please your mail id and contact number please give me. I submitted my name and number and also I shared it. I also saved 7427000475 this number as RoyalGovtJobs. Join me on FreeJobAlert Group. sir banking job and block labels bihar job kaa update dete rahe pze…..
Sir, please give me the anyone job in marketing Field. I’m executive in the marketing field with 3yrs experience. Sir I am worked in private sector contact Labour Act in Facility post as HR Executive now we have no any job please help me soon I have 6 year experience. Nice Job . . . . am job consultant . . . we r getting lot of requirement from many MNC and domastic clients for technical and non technical requirements . . . . can i also post the requirements . . .
Hey send me number your. Sir,Im looking for some banking job in Punjab.I have done my B.com.Now i need job.please help me. I’m a tig welder.plz alert me sir/madam. I want to do job sir. I have complete m.com . . My first preference jobs are police ,army, forest dept jobs. . .
Will you give bank jobs alert? pls sir, Am seriously in need of a job as a cleaner. I stay in abuja and i will o receive job alert. Field staff required in Muthoot Microfinance company for rajasthan. Thanks for Sharing such useful information. Disclaimer :-The royalgovtjobs.com is not associated with the any kind of Government Organization. Here we are only providing Govt Jobs information. We have collected recruitment notification from various Online/Offline sources. We are advise to All the Readers that before apply once you visit & confirm notification on official website of relevant department. Here we are not responsible for any Inadvertent Error that may have crept in the information being published in this Website and for any loss to anybody or anything caused by any Shortcoming, Defect or Inaccuracy of the Information on this Website.